As I recently reviewed some of the poetry I had written within the past year, I reflected upon the state of Christianity I observe all around me today and the way in which I expressed aspects of it poetically. After stumbling upon a poem about Christian contrition and confession, it dawned on me that confession is an important—indeed essential—sacrament needing reconsideration and retrieval. Growing up as a Protestant I was only familiar with the pop-culture view of Catholicism and confession within that Church (you know, the kind that is either still at war with “unbiblical” medieval views, or the kind that treats everything outside their own non-catholic tribe as “superstitious”, "fictitious", "magical", or "blasphemous"). Today I recalled some conversations I have had with both kinds of protestant diatribalists, about the so-called “unbiblical sacraments”, and none strikes me as being more misunderstood than the sacrament of Confession. That might be the way Roman (Western) rite confession is practiced. I seriously doubt that it represents the majority. I have not personally been to confession in a Roman Catholic parish, but I have asked a lot of Roman Catholic friends what they’re experiences were like, and have received a lot of positive, detailed feedback that the kind of priests and parishes which tolerate such pathetic, and somewhat comical confessional practices are not popular, and are not common in the northern midwest regions of America (around where we live). But even if the majority of Catholic parishes practiced confession in such a fashion today (and again, admittedly, I don't actually know how the majority of Roman priests practice it), that is not how Catholic confession operates in Eastern rite parishes. And this, I do have experience in practicing. As a Byzantine Greek Catholic who has celebrated with a handful of parishes across the USA, I can actually dispel some of the “superstitious magic” which Protestants imagine the sacrament of Confession to be instilling. How might I attempt to dispel such prevailing protestant myths of our era? 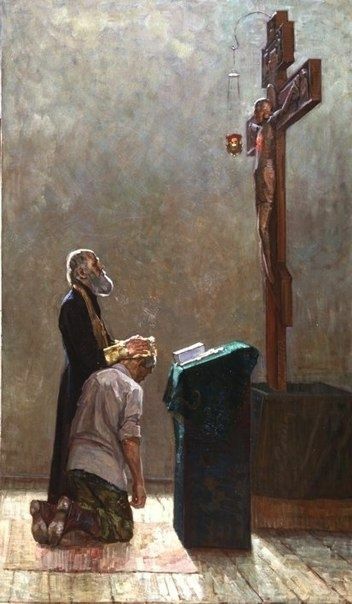 The answer: By illustrating the actual rite of confession within Eastern Orthodox and Catholic parishes. My hope, again, is to dispel some of the worrisome and comical “fictions” which Protestants imagine are occurring at every confession within the Catholic Church, and to show plainly through the rite itself how “Biblical” it actually is (and should be considered to remain). That should help provide a framework for Protestants to consider, if not rethink altogether, the possibility of private confession to an ordained minister of Jesus Christ as a healthy practice to retrieve (as even the mighty Protestant icon, John Calvin, begrudgingly implied as a theoretical possibility, long ago1). My brother, inasmuch as you have come to God, and to me, do not be ashamed; for you do not speak to me, but to God, before Whom you stand. If you are able, please kneel before Christ our God. Facing Jesus and looking attentively to Him, the penitent Christian might then begin with a formal and general declaration, such as: “I have sinned, O Lord, forgive me. O God, be merciful to me a sinner”, followed by more specific details. My spiritual child, who have confessed before your humble servant, I, an unworthy sinner, do not have the power on earth to forgive sins. God alone has that power; yet through that divinely spoken word which came to the apostles after the resurrection of our Lord Jesus Christ, saying: “If you forgive the sins of anyone, they are forgiven; if you retain the sins of anyone, they are retained,” we too are given boldness to say: Whatever you have said to me, and whatever you have not succeeded in saying, either through ignorance or through forgetfulness, whatever it may be, God alone forgives you in this present world and in that which is to come. O God our Savior, who by Your prophet Nathan granted the repentant David pardon of his transgressions, and accepted Manasseh’s prayers of repentance: In Your customary love toward mankind, accept also this Your servant, who is here before You to repent of the sins which he has committed. Overlook all that he has done, pardon his offenses, and pass by his iniquities. For You have said, O Lord: “I do not desire the death of a sinner, but rather that he should turn from his wickedness and live,” and that “sins should be forgiven seventy times seven.” For Your majesty is beyond compare, and Your mercy is without measure, and if You should mark iniquity, who could stand? For You are the God of the penitent, and unto You we ascribe glory, to the Father and to the Son and to the Holy Spirit, now and ever, and unto ages of ages. Amen. May God, Who pardoned David through Nathan the prophet when he confessed his sins, and Peter weeping bitterly for his denial, and the sinful woman weeping at His feet, and the publican and the prodigal son, may that same God forgive you all things, through me a sinner, both in this world and in the world to come, and set you uncondemned before His terrible judgment seat. And now, having no further anxiety for the sins which you have confessed, go in peace. O almighty and merciful God, I truly thank You for the forgiveness of my sins; bless me, O Lord, and help me always, that I may ever do that which is pleasing to You, and sin no more. Amen. O Lord God of my salvation, the Savior and Benefactor of my soul, I am truly sorry for my every transgression, and I firmly resolve never again to offend You by such sins, and sincerely promise to amend my way of life. Implant in me the fear of Your blessed commandments, that I may trample down all carnal appetites and may lead a godly life, both thinking and doing always such things as are pleasing to You. Grant me the strength of Your Holy Spirit, that I may avoid all evil deeds, works, words, and thoughts, and may avoid all snares of the evil one. Shine in my heart with the true Sun of Your righteousness; enlighten my mind and guard all my senses, that walking uprightly in the way of Your statutes, I may attain life eternal. Amen. O sovereign Master, Who love mankind, lead me in Your way, that I may walk in Your truth. Make glad my heart, that I may fear Your holy name. O Lord, mighty in mercy, gracious in strength, aid and comfort and save me, as I put my trust in Your holy name. Do not rebuke me, O Lord, in Your displeasure, nor punish me in Your wrath, but show me Your great mercy and compassion, O Physician and Healer of my soul. O merciful Savior, blot out all my transgressions, for I am truly sorry for having offended You. Grant me Your grace that I may avoid my previous evil ways. Strengthen me, O mighty One, to withstand those temptations before which I am weak, that I may avoid all future sin. Keep me under Your protection and in the shadow of Your wings, that I may serve You, praise You, and glorify You all the days of my life. Amen. 1. In his Institutes of the Christian Religion (Book IV, chapters 14 through 17), Calvin presents a scandalous case against the Roman (Western) practice of Confession in his own day, which transitioned from public confessions and absolutions to private ones. In doing so, Calvin was, of course, attempting to distinguish the domineering Roman expression of faith from Christianity altogether. In those three brief chapters (14-17) Calvin attempts to dissuade his audience from believing the long standing doctrine about Confession as a Sacrament (which he, of course, considered to be Divine requirements, and not merely things indifferent). In chapter 14 Calvin admits that he wholeheartedly approves of the ancient practice that required public confession and absolution, but his rationale against the sacrament of private confession to a priest or Bishop is very brief and seems almost entirely anecdotal, overlooking many pertinent counter-rationales from Scripture and history, and all pertaining merely to the Roman rite illustrated within his own era. In other words, even if Calvin was accurate in his reasoning against private confession as a sacrament of Christ's Church, he strangely leaves plenty of room for disagreement, introducing it and dismissing it rather quickly.